(Nanowerk News) Researchers have scaled up a powerful fluorescence imaging technique used to study biological processes on the cellular level. Previously limited to samples just millimeters in area, the expanded approach can analyze samples with areas up to 4 square centimeters. With further development the new approach could find use in the clinic as a sensitive and precise method for identifying the edges of tumors during surgery. The new macroscale imaging approach is based on a biological imaging technique known as fluorescence lifetime imaging microscopy (FLIM). "Our macro-FLIM system can not only obtain a sample's structural information, but also allows observation of certain biochemical processes taking place within the sample," said senior research scientist Vladislav Shcheslavskiy, Becker & Hickl, GmbH, Germany. "Although our goal is to develop this for clinical use, it could also be very useful in fundamental studies for probing biological processes as disease develops or investigating biological responses to different types of therapy." In The Optical Society (OSA) journal Optics Letters ("Fluorescence time-resolved macroimaging "), the researchers demonstrate the first confocal microscopy based macro-FLIM system with cellular resolution and high molecular sensitivity. They used it to observe the metabolic processes inside a whole tumor in a live mouse, a feat that isn't possible with current FLIM systems. The new system was produced through a close collaboration between engineers and physicists from Becker & Hickl GmbH, Germany, and biologists from Privolzhskiy Research Medical University, Russia. In addition to biological and clinical samples, the new macro-FLIM system could be used to analyze other samples with large areas. For example, it could offer a non-destructive method for determining the media used in paintings that need restoring. FLIM involves precise measurements of the fluorescence decay rate, or lifetime, of a naturally fluorescent molecule or a fluorescent tag or "label" that has been added to tissue. Because the lifetime depends on characteristics of a molecule's environment such as temperature and pH as well as on its interaction with other surrounding molecules, FLIM can be used to obtain information about the properties of the molecule and its micro-environment. Typically, FLIM is performed using laser scanning confocal microscopy, which achieves high resolution by scanning a laser beam across a fluorescent sample to form an image. To obtain FLIM information on a macro scale, the researchers developed a confocal macroscopy system that incorporates lasers with extremely short pulses -- only picoseconds in length -- and very sensitive detectors to sense the fluorescence. The system also included electronics that count the photons and plot their distribution in relation to the time since the laser pulse and the position of the laser beam on the sample. Shcheslavskiy continued "Careful optical design along with the picosecond lasers, sensitive and fast detectors and fast single photon counting electronics allowed us to record fluorescence decay with high precision at macroscale." Confocal microscopy is typically limited to an imaging area of just millimeters but placing the samples in the macroscanner's intermediate image plane allowed the researchers to image larger samples. They then plotted the photon distributions across a large area of the sample to acquire macro-scale fluorescence lifetime information. To demonstrate the cellular resolution of the macro-FLIM system, the researchers used it to image fluorescent microbeads with a diameter of 14.6 microns and live cultured cancer cells labeled with fluorescent dye. They then used the macro-FLIM system to analyze an entire tumor in a live mouse. They did this by simultaneously measuring the fluorescence lifetime of a genetically encoded red fluorescent protein, which identified the location of the tumor, and nicotinamid adenine dinucleotide (NADH), a molecule responsible for energy production in living cells. "The sensitivity of our system was high enough to observe fluorescence of intrinsic tissue components such as NADH without any labeling," said Shcheslavskiy. "In addition to being used to study metabolism in a tumor, macro-FLIM could be used to follow cell death or oxygen status of tumors on a macroscale with cellular resolution." 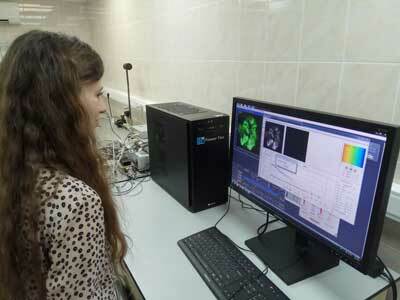 To develop the system for clinical applications, the researchers are working to improve its flexibility and mobility. They also want to combine the macro-FLIM system with a scanning stage that would move the sample to allow FLIM to be performed on areas as large as 10 by 10 centimeters.